Delaware Attorney General Beau Biden has thrown down his gauntlet in the millions at stake between Delaware and Florida over the Nemours Foundation. Alfred I could arguably be considered the most humanitarian of all the celebrated du Pont family members. The family and company changed our tiny state into a global commodity and international tourist destination..
Alfred ranks with founder, E I, who forever ingrained not only chemical knowledge but also social consciousness in the fibre of the company; P S invested $6 million of his own money to completely upend the racist based “Separate But Equal” education system of the '20's. Coleman du Pont, who with his own money constructed Rt 13, the first paved road coursing an entire state. These three cousins bought the company from their uncles in 1902. The elders were about to sell to a competitor. Alfred was the only of the three who worked at Eleutherian Mills. He came up with the grand idea to save the company and keep it here. Without A.I's daring plan for purchase, today there would be no Nemours Foundation, no Longwood Gardens, no Winterthur, no X Station, no Wilmington once pegged as “The Chemical Capital of the World”, no Nemours Mansion, no Mt. Cuba, no Hagley, no Howard High, no Tower Hill School...the list goes on. Think Frank Capra's “It's A Wonderful Life”.with an adverse outcome. In 1927 A.I. 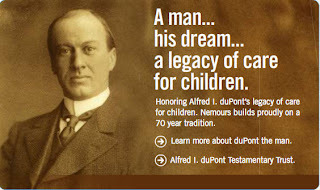 's net worth in DuPont stock was valued at $70 million. That did not include the value of the undeveloped northern Florida land he would acquire totaling 320,000 acres costing $1.6 million (a princely $5.00 an acre) and the seven banks he established there during that time. Alfred, like E.I, had social consciousness. His enlightened values centered on on the elderly retirees who had no lifeline to exist beyond others. He was a social legislator before his time. The bill did not pass. The legislature would not convene for another two years but du Pont was optimistic of its passage going forward. It was not in his character to fiddle over incidentals. Alfred collected names of all those who qualified for his proposed pension plan. For the next two years, he paid out of his own pocket $200,000.00 per year to these Delawareans... anonymously. A few years later A.I fully subscribed to the aspirations of FDR's New Deal, pointing out he had been advocating these issues for years. He believed in the reapportionment of wealth in the country, giving more to the needy and less to the rich. A.I's net worth at his death at 70 years in January of 1935. He and his third wife Jessie Ball du Pont created the concept for Nemours Foundation. They originally considered the Mansion to be converted into the hospital. Jessie and her brother Ed Ball outlived him by many years and invested millions in Florida.